Salsa isn’t just for tomatoes. Mangos, apples, oranges, pineapple and blueberries can all enjoy the limelight when they’re mixed with a complimentary juice and herb. Fruit salsa is also an easy way to jazz up dinner or use up any produce that may no longer be its peak. 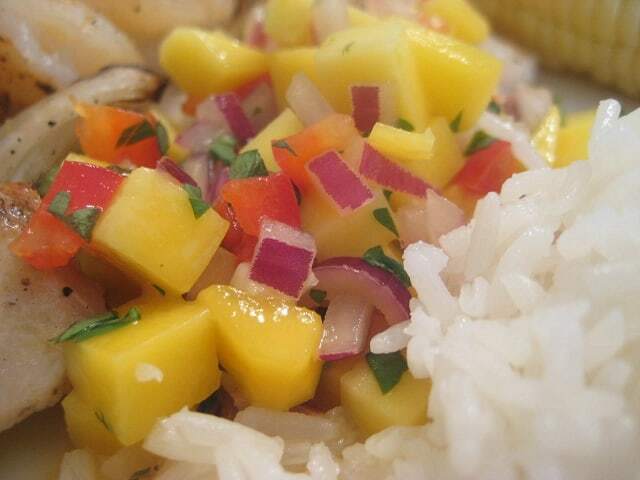 Change the mood of dinner with this one dish: mango salsa. We had chicken and shrimp kabobs last week which could have gone the “outside summer BBQ” route. Adding this mango salsa gave our plates a bright tang that rocked our taste buds. And isn’t it pretty? The colors alone made me want to lick my plate. Taco nights are standard fare for us with little variation since we enjoy the original so much. One bite of this salsa made Mr. Crumbs veer from tradition and he insistent on Caribbean tacos tonight for dinner, starring of course, fruit salsa. A double batch will be made for sure this week as it will not only be devoured for dinner, but it’ll be requested for lunches and leftovers (served over a simple bed of coconut rice). Mango Salsa is made with just a few quarters, (less if your garden is still producing) you can alter just about any dish you have on your menu. The salsa can also be tailored for mild to hot depending on how much jalapeño you decide to add, but don’t forget that jalapenos get hotter the longer they sit, so a warm today may be hot tomorrow. Fruit salsa isn’t prejudice – it welcomes any meat or fish and or even vegetarian dishes. A scoop or two of black or white beans added to the salsa with a side of quinoa would make this a delicious (and super-fast) meatless meal with a decent level of protein too. Finely chop red onion. Rinse in a fine mesh strainer and set aside. Combine mango, pepper, cilantro and garlic in a small bowl. Add lime juice and 2 Tbsp of orange juice and mix well. Add remaining orange juice if additional liquid is desired, plus optional jalapeno. * Make this dish at the start of meal prep so the flavors have a chance to meet and greet. May be prepared and stored covered in the refrigerator for up to 24 hours. Makes about 3 cups. Out of lime juice? Use lemon. No orange juice? Use pineapple or guava juice instead. Have a dish that’s begging for a side of mango salsa? We’d love for you to stick around! If you want updates or new recipes, like us on Facebook or follow us on Instagram! Very nice – I’ll have to try this one. This looks delicious. I love mango and I love salsa. This should be wonderful. I am pinning it now! Love this mango salsa thanks for sharing the recipe. Oh wow Tiffany, I love this! Thank you so much for sharing your recipe! Looks delicious. I love the versatility of salsas – can totally transform just about any dish – including just plopping it on some quinoa. Yummy, healthy eating. Thanks for sharing! Ooh, with quinoa sounds delicious! Great idea! I recently tried Mango Salsa and I LOVED it! Congrats – you’ve been featured this week at Inspire Me Monday at Create With Joy! That looks so good. I love mangos. Thanks for linking up to Healthy 2Day Wednesday! Hope to see you back this week. Can’t wait to try this recipe! Looks amazing! We’ve made this twice so far, as written and then with pineapple too. Both were really good!! Looks yummy! Thanks for sharing at the Pomp Party! Hope to see you back next week! I think I could snack on that all day! Love mangoes! Thanks for sharing. LOVE! mango salsa.. wondering if the frozen mangos from trader joe’s would work in a pinch.. or would those be to mushy? Hmmm… those may work. I’d let them thaw first though. Even fresh mangos have some juice, so some liquid from being frozen should be fine. You can always adjust the additional juices as well to suit your tastes. The extra liquid would be great if you’re serving with rice though! 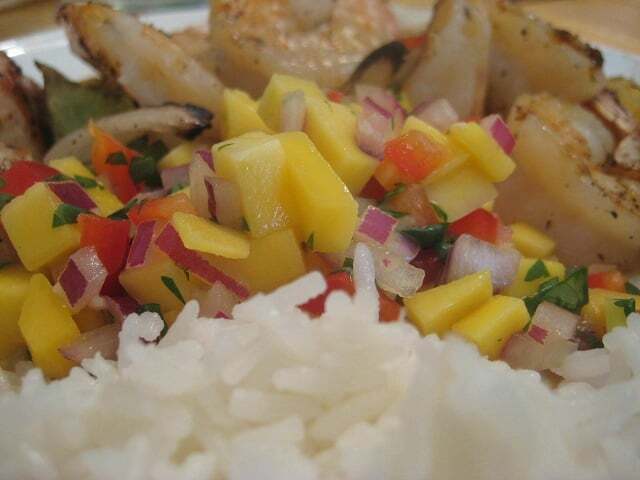 I think Mango Salsa is one of my favorites and your recipe looks awesome! Hope you have a great week and thank you so much for sharing with Full Plate Thursday. I can see using this salsa to top so many things. Thanks for sharing it on foodie friday. omg! i cannot wait to make this. I get it at Qdoba and LOVE IT! We just started back up our link parties and we would love if you came and linked up at The Humble Brag. Each week, one lucky featured blogger will get one free week of advertising, which mean thousands of ad views a day! Hope to see you there. Thanks for the invite Jacie, heading over now. I hope my mango salsa lives up to Qdoba! hahaha, homemade is always better than Qdoba! Thanks so much for linking up last Friday. Hope to see you back tomorrow to link up and see if you were featured or even won the free ad space!